I recently read an article produced by the NSW Centre for Education Statistics & Evaluation titled Cognitive load theory: Research that teachers really need to understand. It was a well written and easy to comprehend review of academic literature on Cognitive Load Theory. However, the article poses this proposed debate of how people learn best and broadly divides it into two approaches to teaching practice, explicit instruction vs inquiry learning. Last year I attended a PBL conference in Zurich and the same notion occurred in a debate between Professor Henk G. Schmidt, a pioneer of PBL versus Professor John Sweller. This debate was the educational equivalence of the recent Mayweather versus McGregor boxing match. In one corner, we have the inquiry or PBL approach, which many people believe is about allowing students to discover or construct some or all of the information themselves. In the other corner, are those who believe that learners do best when they are provided with explicit instructional guidance in which teachers clearly show students what to do and how to do it. However, I propose that these two approaches are not in opposition and a deep understanding of both approaches are needed by all teachers. Cognitive Load Theory, as the title of the article suggests is definitely something that all teachers need to understand. In 1956, cognitive psychologist George Miller produced an influential paper title ‘The Magical Number Seven, Plus or Minus Two‘, which proposed that short-term memory is subject to certain limits including span and the quantity of information that can be stored at a given time. Cognitive load theory supports explicit models of instruction, because such models tend to accord with how human brains learn most effectively (Kirschner, Sweller & Clark 2006). Explicit instruction involves teachers clearly showing students what to do and how to do it, rather than having students discover or construct information for themselves. Furthermore, it is important that teachers understand the limitations of working memory and avoid making simple mistakes in instruction that produce cognitive overload and are harmful to student learning. However, these mistakes can occur in teacher-centred instructional environments that focus on explicit instruction. Some examples include the ‘redundancy effect‘, which can occur when a teacher reads the text projected on a screen to students. This requires learners to process redundant information and inhibits learning because it overloads working memory. Another example is the ‘split attention effect‘, which occurs when learners are required to process two or more sources of information simultaneously in order to understand the material. An example, is when a diagram is used to explain a concept, but it cannot be understood without referring to a separate piece of explanatory text (common in worksheets). In this instance the learner is required to hold both sources of information in their working memory at the same time and to mentally integrate the two. This places a high cognitive load on the working memory, reducing the ability of the learner to transfer the relevant information to their long-term memory. On the contrary, these issues also occur in student-centred instructional environments that focus on PBL. The most common issue is the creation of extraneous cognitive load, which is the ‘bad’ type of cognitive load, because it does not directly contribute to learning. For example, a common misunderstanding of PBL is ‘minimal guidance’. Therefore, teachers incorrectly see themselves as ‘guides on side’, rather than activators of knowledge. Facilitating an environment where students have to solve problems for themselves, with minimal guidance from the teacher is detrimental to student learning. This approach imposes a high cognitive load, but does little to encourage students to make meaning of information being learnt, often because the student’s attention is focused on solving the problem rather than the learning. What is the intersection between PBL and Cognitive Load Theory? So how can PBL benefit from an understanding of cognitive load theory? Dr Michael McDowell the author of Rigorous PBL by Design provides some coherence to the alignment between PBL and Cognitive Load Theory. In his blog titled The Missing Ingredient in PBL: Direct Instruction he proposes that direct instruction is a missing approach in many problem and project based learning environments and as a result a significant number of students are not realizing the learning gains we [should] expect. Furthermore, he argues that we need to utilize effective direct instruction in the PBL/PrBL classroom specifically in situations where a ‘high intrinsic cognitive load‘ is placed on student memory as they are novice learners building new knowledge and skills. Great idea. How does this work in a classroom? I recently visited a teacher in a year 5 classroom who attended a workshop presented by Dr McDowell. The teacher was utilising Project Based Learning as the primary pedagogy and students were working in groups to solve real world problems regarding the geography of Western Sydney. Existing within the classroom were the key elements of project based learning including entry event, driving and need to know list. However, this approach was more than just minimal guidance, allowing students to construct their own knowledge. Firstly, there were clear benchmarks linking targeted instruction opportunities for students (often as a result of formative student assessment data). These benchmarks not only scaffolded the learning in project, but they also provided a clear need for explicit instruction. Both the ‘simple-to-complex’ and ‘part-whole’ approaches where utilised in the early benchmarks to afford students the opportunity to build their mental representations of knowledge in this project. The teacher was the key activator of this knowledge and explicit instruction was the driver. Subsequent benchmarks, required students to make connections between the knowledge they had acquired, encoded and stored, and the project they were working on as a group. If the explicit instruction had not occurred, the result would be ‘extraneous’ cognitive load being placed on students as they attempt to solve the problem and work as a group. Secondly, all learning intentions identified were represented as a transparent success criteria, showing the development of knowledge at a surface, deep and transfer level. Furthermore, within the success criteria there were clear models helping students reduce the burden on working memory and allowing them the opportunity to transfer the information into their long-term memory. Clear success criteria and examples for students at surface, deep and transfer. 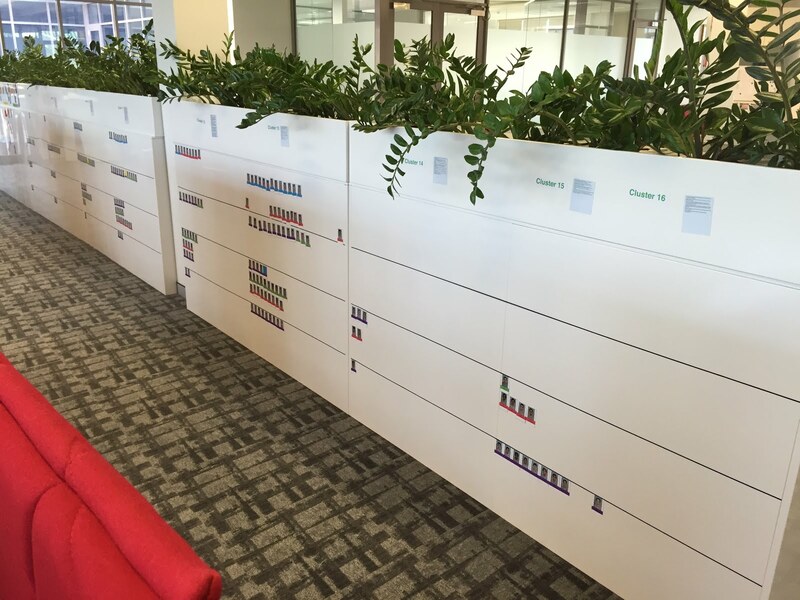 The integration of benchmarks with explicit success criteria at different levels within the project. There is still considerable work to be undertaken in this area. However, hopefully this blog provides some coherence in the comparisons between PBL and Cognitive Load Theory, rather than the contrasting view that is often presented. At a conference recently I was asked to reflect on what I remember learning at school. These experiences could include subjects, topics, projects, specific content or skills. I must admit, I actually found this task quite challenging (which could be a reflection on my memory). However, I do have three vivid memories, that I could recall and each one was a project. The first was the wooden pencil box that I made in year 7. The second was the BBQ utensils that I made and marketed in year 8. The third was made in a year 10 commerce project where we marketed a new soft drink product. During a conversation with a colleague, I was challenged to look beyond recalling the product that I created, but to discuss the knowledge that I learnt. I found this extremely difficult and slightly distressing that I could not recall any specific knowledge from these engaging learning experiences that were etched in my memory. This experience highlighted a question that I constantly see experienced by many teachers in the infancy of their PBL journey – What is the difference between ‘doing projects’ and Project Based Learning? What is the difference between ‘doing projects’ and ‘Project Based Learning’? On the surface there are some very distinct differences. Many PBL educators often use the metaphor that ‘doing projects is the dessert’ and ‘Project Based Learning is the main course’. My colleague Kurt Challinor (@kchalls) uses the Master Chef TV show to explain the difference by comparing the ‘Adriano Zumbo Croquembouche Tower’ as a project against the ‘Invention Test’ which is more like Project Based Learning. Furthermore, there are a number of resources available to help teachers differentiate, like the one below that compare and contrast the unique differences. Also, the New Tech Network presents a great sense maker that visually highlights the difference between a traditional taught unit of work with a culminating project (like I experienced as a student) vs the process of Project Based Learning. All of these resources make sense on the surface, however many teachers fail to recognise that Project Based Learning is a process of sustained and deep inquiry. Rooted in the cognitive architecture of how the brain works and how humans learn. Without fully understanding this process our greatest intentions often result in engaging learning experiences for students, where deep learning fails to prosper. The issue resides in what I refer to as the ‘PBL Black Box’. Like the black box flight recorder on an aeroplane, people understand the end product but not how it is generated. For example, they understand a project starts with the entry event and culminates with the end product. They are unsure what exactly happens in the middle of a project. Many believe that it is self-directed learning or inquiry, some believe it is student voice and choice or collaborative learning. But the mystery remains, what exactly occurs during the project process to ensure that students learn the required content and skills. The answer is in understanding the relationship between the elements of the PBL instructional core. At the core of any project is the content. This is the non negotiable knowledge that students are expected to master by completing the project. By utilising the ‘need to know’ list this should drive the inquiry cycle to help students identify, acquire and receive feedback from the different learning experiences in the project. Outside the content core is the product, this relates to the skill sets that the students will acquire as a product of the PBL process. Often it will take more than one experience in PBL to develop these skill sets. Finally, the PBL process is what ensures that the content and product are developed and deepened for each student in their PBL experience. If fidelity to the process is not maintained by the teacher it will result in learning gaps within the content and product for each student. This issue is often masked by the increase of student engagement in a project. Engagement assists in the learning process, but is not the only factor in academic achievement. From the entry event students should be able to identify the content and skills that they need to acquire in order to complete the project. This is the first step in the inquiry process and is an ongoing measure used throughout the project to ensure that students are building upon their knowledge and skills. The assessment rubric provides students with a snapshot of how they will receive feedback throughout the process to ensure that their end product meets the required criteria. The inquiry cycle is driven by the need to know list and requires appropriate scaffolded intervention by the teacher. Appropriate formative assessments are made regarding student progress and feedback is given. This process will continue in order to help the students deepen their knowledge and skillsets within the project. Throughout the project students and groups will progress at a different pace with content and skill acquisition. The use of differentiated workshops driven by the ‘Need to Know List’ and formative assessment helps ensure that all learning opportunities are maximised. Appropriate feedback is given to students and the process is continued. Note: Inquiry process is not a lockstep process and should be modified to meet the needs of the students and groups within the class. Each group is working towards their end product or culminating event throughout the inquiry process. Feedback given to students and groups is key to ensure that they are able to create a solution that responds to the entry event. Evaluation should focus on student self evaluation regarding their content and skill development, peer evaluation regarding their collaboration and project evaluation to provide teachers with opportunities for future developments. Why PBL gets a bad name? The lack of process understanding by teachers when creating projects is often what gives PBL a bad name. The effective implementation of this process brings together a range of high impact teaching strategies and makes them authentic in the context of the classroom environment. The diagram below shows the high-impact, evidence-based teaching strategies identified by John Hattie. Below is the PBL Funnel which shows how each of these strategies has a place within the PBL framework to provide a high impact on student learning and development of skillsets. A deep understanding of the PBL process affords teachers the opportunity to address each of these strategies in their ongoing practice. Hopefully, this provides you with some coherence regarding the importance of the PBL process against the need to create just projects. This process is something that will take time for staff to fully understand, however modelling is an excellent strategy to ensure that it can be sustained. Think about modelling the process in your staff meetings or professional development opportunities as an appropriate next step. The key to the ongoing success in Project-Based Learning is the ability to scaffold for students the development of skill sets, as well as content. Furthermore, it is important that teachers who teach in a PBL context have a deep understanding of the purpose of grouping and use a wide range of scaffolds that foster successful group work strategies. Recently, I conducted a workshop for some teachers on helping them come to a greater awareness of these scaffolds and their unique purpose. The workshop was presented in a CSI theme, where we analysed a dysfunctional group and explored some possible reasons for the demise of the group and identified strategies that could be employed in assist future groups. During the presentation of a project, you notice that Kenneth is doing all the talking. Adam tries to add his thoughts but is constantly cut-off by Kenneth. Christopher presents a prepared part of the presentation, that does not sound like something he would produce. Furthermore, Robert stands away from the group and does not contribute to the presentation and every time Charlie tries to speak he just laughs. The next day you receive a note from the parents of Kenneth and Adam expressing the hard work that their son has contributed to the project and their group members have let them down. They are extremely concerned that the lack of effort by other group members will have an adverse effect on their overall mark. In analysing the peer feedback data you find that all students have scored their group members low, while scoring themselves high. A range of reasons have been provided with the scores. THE SUSPECTS – Who is involved in the success or failure of this group? Below are the suspects identified from the investigation. They include the five students and the teacher in this project. THE EVIDENCE – What strategies could have been used to stop the demise of this group? The group contract is the glue that keeps groups functional. Without this key scaffold, dysfunctional groups will occur more frequently. We cannot just expect that students will learn collaborative skills by the more opportunities that they have to work in groups. Is the step-by-step firing clause evident? Continual reference and application of roles throughout project, so roles must be taken seriously. Assigning group roles is important to the success of groups. However, it is important that the teacher is purposeful in the selection and rotation of leadership opportunities within the class. Tuckman’s team development model is good guide for developing leadership capabilities within groups. Meet with the group leaders on a daily basis to discuss the group’s progress and any questions their group might have. Provide the group leader support with their responsibility. Have the group leader keep a daily log of what the group accomplished. Award bonus points to the leader if all deadlines are met. The use of project pacing charts provide a visible progress snapshot of each group in the class. They also allow students in the class to have autonomy on the decision-making regarding their progress. This can also be used in conjunction with the group contract, so that there is equity regarding the distribution of tasks within the groups. Ask the students to fill in due dates and responsibilities for all aspects of the project. Ensure that they assign the and record all student responsibilities and contributions. It is important that this scaffold is visible to all students during the project. The use of group observation checks provides accountability to both students and teachers for the role that they play in managing the groups within PBL. Concerning the teacher it allows them to collect evidence on each student, so that further explicit teaching may occur especially in areas where students are stuck in working collaboratively with other students. Regarding students it provides them with feedback that they can feed forward into future group situations. Ensure that you a range of formal vs informal check-ins with all groups. Manage opportunities for brief check-ins with students in a particular role from each group. Make sure that you document the discussion and provide the feedback to students. This make require students to note-take the feedback on their own rubric. Sometimes the only time that we collect feedback from the group about the performance of all group members is at the end of the project. This information can only assist with the next project, not the current project. The use of formative group evaluations can provide the teacher and groups members with evidence and direction regarding resolving current issues, before they become significant issues. If you are formatively assessing, you are managing your classroom effectively with accountability, reflecting on your teaching and their needs, and ensuring quality PBL project products. It is important to understand how this information will be collect and presented for all students in the group. Ensure that the form is easy to use and understand. THE ARREST – Who is responsible? Unfortunately, the teacher is responsible for providing the enabling elements to ensure that groups can work together effectively. All the elements listed in the evidence above where not used by the teacher in this scenario and hence the group was dysfunctional. These elements are only the basic elements in managing groups, there are many more that you can use or some that you may currently use. The key is to ensure that everything that you select has an explicit purpose to enabling students to grow and develop their collaboration skills. If you have any others that use, please share them with me and I can add them to the evidence. The design process of projects in Project-Based Learning is crucial in any attempt to improve student learning via the implementation of contemporary learning pedagogies. The first victory for teachers in the implementation of PBL is definitely increased student engagement (often just a result from increased teacher engagement). However, to achieve sustained improvements in student learning a focus on precision and consistency in the essential elements is required. Michael McDowell in his blog post “3 Ingredients for Authentic PBL” provides a valuable insight into the issue of measuring the impact of PBL on improving student learning. Michael refers to the research of John Hattie that found the overall effect size of PBL is at .15. However, when students are learning more complex knowledge and skills this increases to an effect size of .68. The difference is that some projects are designed to engage students as the primary focus and often fail to address sustained inquiry and the achievement of academic rigour. For teachers embarking on their PBL journey they spend considerable time on making the project ‘authentic’ and generating appropriate ‘adult connections’. Don’t get me wrong these are needed, but if they are the only elements your project is addressing then this will ultimately promote surface learning and limit the overall effectiveness of student learning. So what should you do differently? I have always found Steinberg’s 6 As for project design as a good starting point for creating quality projects (See the adaption by the New Tech Network). Each pillar provides a good point of reference for teachers in their attempt to change the way they teach and how students learn. However, the areas that have the most influence on student learning are the core pillars shown in my quality project flowchart below. It recognises that all pillars are essential, but the identified pillars in blue have the greatest impact on student learning. I agree with Michael McDowell in his blog that states clarity, challenge and culture are the key ingredients to improve student learning through PBL. The marriage of a deeper understanding of these ingredients with a sustained focus on the core pillars can ultimately improve the design of your projects. So if you are starting your PBL journey what insights do you need to know to ensure that you create quality projects for your students. Academic Rigour – The key to academic rigour is to ensure that students are constantly challenged throughout the project. Furthermore, student learning should always be supported with appropriate scaffolds that meet the students at their point of need. All of this just seems like good teaching practice. However, teachers need to constantly gather appropriate assessment data from students and provide targeted instructional interventions to improve student learning and performance. Not all students will have the same needs, which increases the complexity in a collaborative environment. However, within a student centered environment there are greater opportunities to provide workshop interventions for students and even mastery learning can provide some good insights to promoting academic rigour. Make sure that you don’t sit back in wonder and awe of the increased student engagement in your projects, collect data, assess learning and extend understanding. Apply Content and Skills – If the learning that students undertake during the project is not applied to the end product, then it is not Project-Based Learning. This can be an easy mistake to make. However, you can bridge this gap by ensuring that the need to know list drives and provides clarity to the learning intentions throughout the duration of all learning opportunities in the project. Assessment – Ensuring that you have multiple opportunities for ‘formative assessment’ within the project is important to ensure that academic rigour can be sustained. Try to avoid making formative assessment formal and ensure there are a range of opportunities at the point of student need. Co-constructing success criteria’s with students will provide a great opportunity for students to gain a deeper understanding of what success looks like in the project. Dylan Wiliam provides some great practical examples of formative assessment that can be utilised in your project. Active choices – This is where a culture that is focused on learning is fostered. This aspect may take time to develop. However, by building in metacognitive structures to your project that allow students to reflect and make informed choices regarding their learning pathway will ultimately have an increased impact on student learning. I know easier said than done! But an appropriate next step could be building in visible thinking routines into your project pathway. Don’t be too hard on yourself if don’t always address all aspects of the 6 A’s, they are only a guide. The key is to make sure that you are always trying to move beyond engagement to developing greater clarity, supporting challenge and promoting culture. Finally, all improvements start and end with the effectiveness of your project design. Leave a comment What are the non-negotiable elements in Project Based Learning? As the new academic year begins in Australia, many schools will be embarking on new and innovative pathways to try and meet the dynamic needs of their students. These initiatives come in various shapes and sizes, all with the primary focus of engaging students in the learning process to improve learning outcomes. For some schools in 2017, the implementation of Project Based Learning (PBL) is part of their strategic direction. However, as many educational leaders would attest, change management is a daunting and difficult task. Therefore, I thought it would be a good opportunity to provide my ‘top five’ considerations for educational leaders when implementing PBL. It is great that you have made the decision to implement PBL. Hopefully, you have strategically allocated resources to this initiative. However, you also need to apply some deep thought, especially amongst your leadership team about what you want as the end game for your students. You are equipping them with a range of 21st skills that will change how they learn forever. Overtime you will create critical and independent learners who will struggle in learning environments that transfer content and fail to challenge them with new and creative insights. Ensure that you have an overarching plan for each subsequent year of schooling, focusing on the pedagogy employed and the critical skills to be developed. If your goal is to engage year 9, you better apply some thought to what will happen in the following years. As I stated in the introduction of this blog, change management is extremely difficult. But the rewards far exceeds the difficulty experienced in the adjustment stage. Therefore, it is extremely important for leaders to maintain a consistent focus on the reason they made the decision to implement PBL – to improve student learning. There will be many individuals and groups that will try and distract you and attempt to chart a different course in your journey. Some students and teachers will want to maintain the status quo, often because it is easier. Learning new content and skills should be challenging, that is what makes it so rewarding. PBL has a strong focus on the development of life long skills such as communication, collaboration and critical thinking. For some people these skills may take years to develop and they require multiple opportunities to learn and gain feedback on their skill development. Your decision to implement PBL should be because you want to maximise the learning opportunities of the students in your care. Never forget that everything you do should have a direct link to improving student outcomes. Formative and summative assessment …..
All of these terms are the key elements within Project Based Learning. Therefore, it is important that the leadership of the school ensures that there is ‘relentless consistency’ in the use of these terms. This starts with leaders using the language in their own conversations and extends to simulating the language and processes in professional development opportunities. If staff have a question that should become a need to know, there are always next steps in the busy school environment. John Larmer for BIE gives a good insight into the use of ‘project slices‘ as a structure to help staff develop a sound conceptual understanding of PBL terminology and processes. The teachers must model these expectations to the students in their daily practice and soon you will start to hear the parents using similar language. Employ non-teaching staff for supervision tasks to free up teacher time. Podcast meetings so that teachers can watch them at a convenient time affording more time for face to face professional development and planning. Look at your school timetable to find opportunities to embed professional learning opportunities. Start earlier, finish later, reduce admin time by utilising technology ect. Often you will have to let go of something old, in order to gain something new. Tough decisions are the responsibility of leaders. Have a student focus group each week. Select up to five students of varying attitudes towards PBL for a lunchtime meeting. Set confidentiality norms regarding the meetings and give them the opportunity to express their thoughts on PBL in a safe environment. Start with the positive ‘I like..’ then move onto clarifying confusing aspects of classroom practice by using ‘I wonder…’ and finally gather their thoughts on ‘next steps…’. Change up the groups each week to give each student an opportunity to express their thoughts. Parent university meetings are a great way to help parents grapple with the changes in instruction at your school. The focus of a parent university is an opportunity for students to provide peer support to their parents in a small group environment, facilitated by the teacher. Being a small group (No more than 10 parents), the teacher can help clarify any misconceptions by both the parents and the student. Using something like a ‘project slice’ is a great way to simulate the learning process and help parents experience all phases of the project. The more feedback you get on an informal and formal basis, allows for a greater opportunity to grow and improve. Hopefully, these considerations provide you with a starting point for future discussions regarding your PBL journey. Good luck. Leave a comment What is the role of PBL in the STEM revolution? Schools are being challenged to provide students with a more authentic, relevant and student centred learning opportunity. However, the yard stick for school success in NSW at the moment is achievement on a standarised examination. So can we prepare students for the challenges of the 21st century and achieve success in the HSC? The answer is ‘YES’. The reason why I know the answer is because I have witnessed it first hand at Parramatta Marist High School. To give some perspective, “it is the oldest Catholic school in the country, but Parramatta Marist High is a model of modern education.” Through the implementation of Project and Problem Based Learning the school has been able to focus on key skills such critical thinking, problem solving, presentation skills and social development and also navigate a crowded curriculum. Students at Parramatta Marist now have an increased confidence to collaborate with other students in solving authentic and rigorous problems. But that is only part of the story. Parramatta Marist has been consistently in the top 100 schools in NSW over the last seven years, with the 2014 cohort achieving our best results so far. The remarkable improvement saw the comprehensive low-fee Catholic school jump from 73rd in the state to 42nd on a list of the state’s top-performing HSC schools, outperforming private schools such as The King’s School, Scots College and Trinity Grammar. 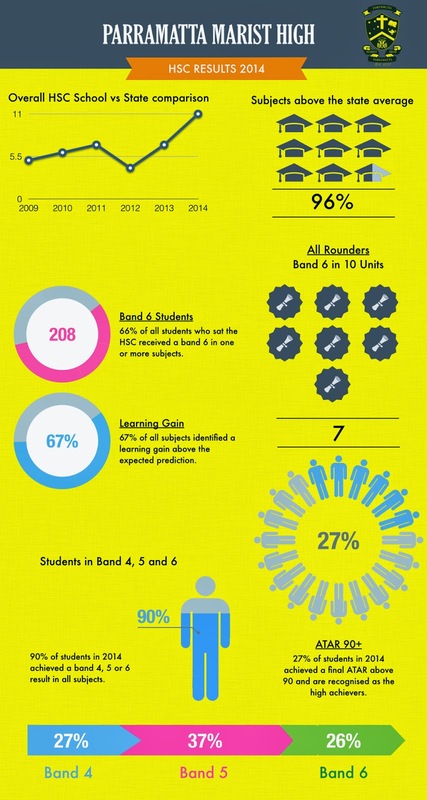 The 2014 cohort achieved some outstanding individual student success as highlighted on the infographic below. But the statistics that highlight the success of our focus on a student centred pedagogy is the fact that 90% of all students achieved a band 4, 5 and 6. This shows that students who work together can learn from each other and improve the overall results of a cohort. Any change is challenging and results are always expected. But many schools will be reassured that such a feat is possible. It requires the confidence of school leadership to manage the change, especially by a dedicated investment in the human capital of teachers. It is imperative that teachers are given the skills to navigate the change and are confident that a focus on skills will always result in academic improvements. Leave a comment Does a change in pedagogy improve results? How to keep it real? I was lucky to meet Sam Seidel, author of Hip Hop Genius when he was involved in PBL World Australia in 2013. The theme of his keynote presentation for like minded educators attempting to implement Project Based Learning (PBL) was to – Keep it real! From my experience in implementing PBL, one of the key factors for increasing student engagement in the classroom is Creating Opportunities for Authentic Learning or as I like to call it COAL. It is the goal of all 21st century educators to create these experiences, however some times these ‘real life’ experiences occur naturally such as existing competitions or current events. However, often teachers may need to craft real world experiences or occupations to align with the curriculum content. The key ingredient is to keep it real! Teachers need to be challenged to source opportunities to include COAL into their classroom. Not only does it increase student engagement with the curriculum content, but it also provides a foundation to challenge students to think critically, apply problem solving techniques and develop their social and emotional intelligence. This can be challenging for teachers without a focus of student-centred pedagogies such as Project or Problem Based Learning. In 2014, Parramatta Marist had the opportunity to participate in a Bridges Project organised by the Global Educational Community (GEC). The project promoted the collaboration of schools in China, United States, Singapore, Australia and Finland on a STEM themed engineering project. Parramatta Marist were fortunate to collaborate with Manor New Tech in Austin, Texas. This COAL opportunity occurred organically from an openness to collaborate globally and a strong focus on student-centred learning and problem solving. As a result, educational outcomes are also maximised when COAL is targeted. Below are few tips that I have identified to help you in your quest for COAL in your classroom. There are a number existing competitions that can be easily aligned to curriculum outcomes. These competitions provide an authentic context and importantly an external audience for judging student work. The University of Wollongong has a variety of Engineering, STEM and Mathematics competitions. 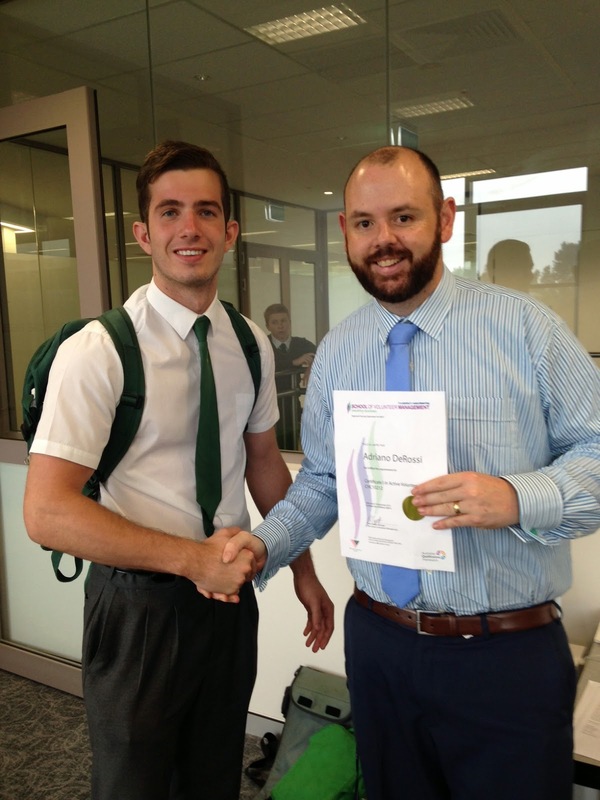 Our students were finalists in the Maths via digital media competition in 2014. Screen it is a competition facilitated by ACMI. It promotes the use of digital media which can be incorporated into a range of curriculum areas. In 2010, our Year 10 students were the winners of the competition. Australasian Problem Solving Mathematical Olympiad is a Challenging Problem Solving Contest for Students up to 14 years. Australian History Competition is prepared by the History Teachers’ Association of Australia and the competition focuses on the Australian History Curriculum for years 7 – 10. The Tournament of Minds is a problem solving program for teams of students from both primary and secondary years. The use of content experts is a great way to increase the authenticity of your classroom. Some of the best projects I have implemented have had an external expert. From local politicians, scientists, engineers and journalists, all have challenged students to achieve deeper levels of learning. In 2013, considerable time was spent in populating a parent occupation database. The occupation and interest details of parents were collected to be used in the construction of our PBL projects. The primary aim was to use their expert knowledge and interests as content experts and/or external audiences in project presentations. The secondary aim was a way for teachers to open up channels of communication with parents regarding what is taking place in the classroom. In recent times staff have used technologies such as skype to bring globally renowned experts into their classroom. Providing students in high school with the opportunity to complete tertiary courses is a great way to challenge students in an educational setting. Adriano De Rossi (below) completed a Certificate 1 in Active Volunteering through the Max Potential Program which has also provided him with opportunities for further tertiary courses to be completed in year 12. The University of Notre Dame also provide an Authentic Learning Opportunity for students through their Logo Course. Creating connections for students in the workplace can foster authentic learning opportunities. Especially, student mentoring which provides students with an opportunity to develop social and emotional intelligences. In 2014, Year 10 students had the opportunity to participate in the Work Inspiration Program. 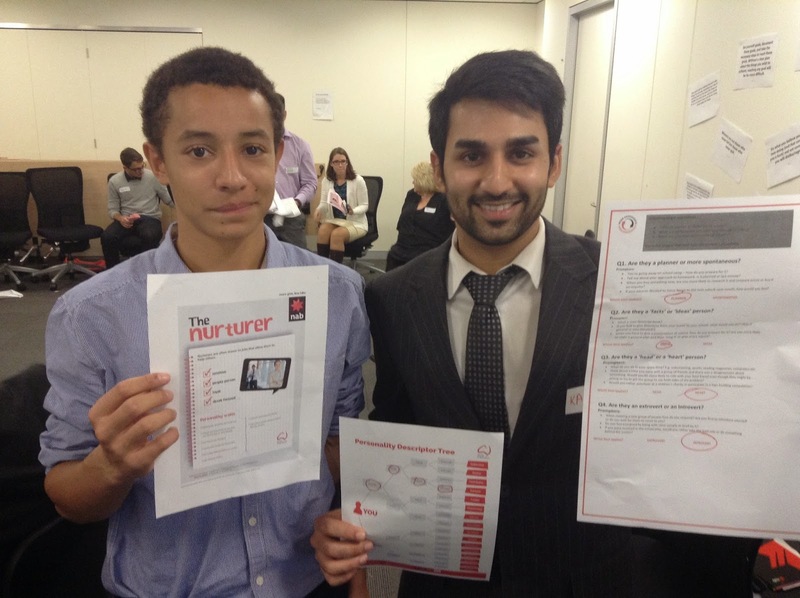 This program aligned students with mentors at the National Australia Bank. Culminating in students and mentors working together on a collaborative real life project. This was definitely an authentic learning opportunity. Finally, I started this blog with the idea ‘keep it real’ and I think that is the key. If you want to achieve COAL in your classroom you have to constantly ask yourself – ‘would this happen in real life’. This should reduce the existence of artificial or fake classroom focuses and provide opportunities for students to challenge themselves to achieve learning opportunities that are outside the boundaries of the classroom. If you have any further ideas to achieve COAL please share them. How to put faces on the data, that make teachers face up to literacy issues? 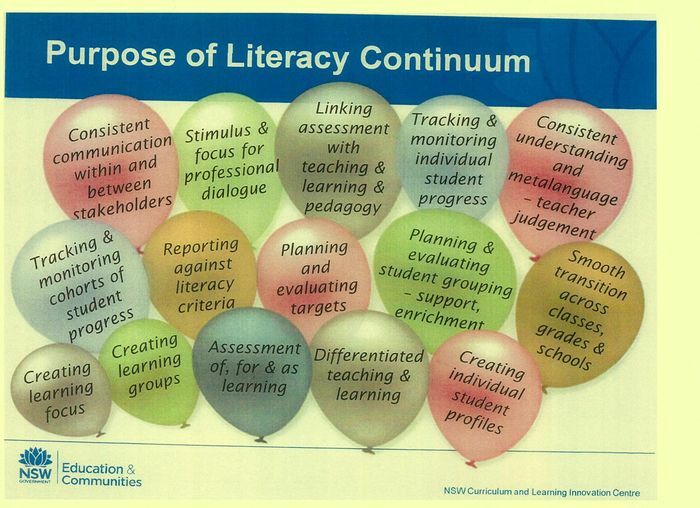 During this term all staff have participated in a collaborative focus on unpacking and implementing the Literacy Continuum. Our primary aim of this PLT focus was to provide staff the opportunity to develop a greater awareness and ownership of our data wall. However, what we discovered was more than just an issue with putting faces on the data. As an example, many pre-service teachers find it difficult to make judgements regarding student assessments in specific subject areas, unless they are using a very structured marking scheme. This is often due to lack of experience and subject knowledge. Interestingly, during this PLT many experienced teachers found it difficult to make judgements on student work against the continuum. Comments were often made that they were ‘guessing’ student levels. As a result, the continuum was often identified as the scapegoat for the confusion, rather than an opportunity for teachers to improve their knowledge and skill set in literacy learning. Just like pre-service teachers this confusion or guessing highlights a lack of depth in understanding of key literacy aspects that definitely impacts on the learning of students at our school. Considerable time at the start of the PLT was spent on explaining to staff that aim of this PLT was to allow staff to own a living data wall for students in yrs 7-10 throughout 2016. However, in the process of collecting, judging and discussing student work, many staff lost sight of the WHY and become fixated on WHAT we were doing. This also may have been the root cause for many of the collegial discussions on literacy learning to be sidetracked regarding house keeping and logistical issues. 3. What happens after diagnosis? Many staff were able to diagnose literacy weaknesses by the end of the PLT. However, the development of appropriate intervention strategies was not easy for many staff. Especially, in the context of PBL, staff have found it difficult to implement appropriate literacy interventions imbedded into the project work that students are undertaking. 1. At the start of every project, look at the level of students in your classes. 2. Plan appropriate literacy intervention activities to extend students at specific cluster levels. These may include small focused structures in a workshop environment. 3. At the end of every term discuss with your teaching team members the students in your classes and look at moving the students along the continuum. Overall, I think this has been an excellent PLT that will improve the literacy learning of students in our school and continue to improve our outstanding academic results.